I have always thought that the first book I’d read by Gabriel García Márquez would be One Hundred Years of Solitude. To be honest One Hundred Years intimidates me. This is the tome to Magic Realism, a genre I am not particularly partial to, but which I will read in smaller volumes. One Hundred Years is right up there with War and Peace. A mountain to be conquered. So whilst I build up the courage, I read Of Love and Other Demons and really enjoyed it. It is in part a love story heavy with themes of religion and of redemption. Marquez writes that the book was inspired by the discovery of the remains of Sierva María De Todos Los Ángeles, the twelve-year-old daughter of an American-born aristocrat, who died from rabies. In life, she was venerated for the miracles she had performed. Sierva María is born to aristocratic parents, the result of a loveless union. Márquez traces the history of Sierva María’s lineage from her great-grandfather to her depressed and lazy father who does nothing but languish on the estate, pining for his first love and paying no attention to his daughter. Her mother Bernarda is a cacao addict who is also lost in the memories of a love she too has lost. Rejected by her parents from birth, she is raised by her father’s slaves who instill in her a belief system of their own, a mélange of their own Yoruban beliefs together with their master’s Catholic beliefs. Sierva María is bitten by a rabid dog on the eve of her twelve birthday and from then on is subjected to a host of treatments for the disease even though she shows no signs of illness. Given all the attention she overplays her ‘affliction’ to such an extent that everyone becomes convinced that she has not only gone mad but is possessed by demons. It is then decided she will undergo an exorcism. The priest put in charge of her exorcism is a reluctant exorcist – Father Cayetano Delaura. He, however, falls in love with the young girl, and they embark on a love affair that sees him banished from the monastery. A good part of the book is dedicated to the girl’s father, Don Ygnacio and his renewed concern for his daughter – which is ultimately what leads to her admission to the monastery and to her exorcism. After Father Delaura is banished, the Church subjects the girl to more exorcisms, fuelled by the belief she is the cause of any and all misfortune that befalls the monastery. Whilst infusing the book with religious themes, Márquez also makes Dr. Abrenuncio central to the book. He is a man of clinical medicine, a self-confessed atheist who is quick to see through the girl’s illness and declare very early to her father that: ” No medicine cures what happiness cannot”. He denounces the father’s search for a religious cure for the girl, and throughout the book remains the voice of reason regarding Sierva’s Maria’s plight. Father Delaura, until the very end, remains true to his faith and belief that the law of the church will free them both to continue to see one another and to ultimately marry. There is redemption in Don Ygnacio’s renewed loved for his daughter and in his admission of how much he had wronged her, perhaps understanding too late that Dr. Abrenuncio’s advice was all he need have heeded. By the end, he has a renewed belief in God, even as he admits that religion was not the cure she needed. This is a novella so it was a quick read. I guess baby steps for me when it comes to Márquez. It is worth reading. 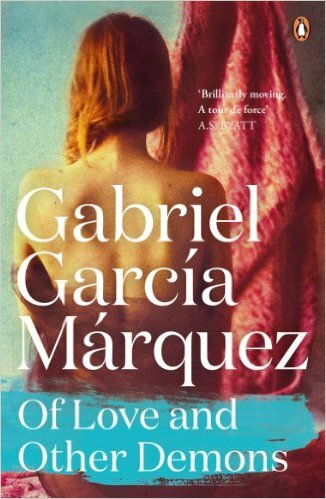 This was my first Márquez, outside his short stories, what a beautiful well written story – a tale of faith and forbidden love. The one most vivid in my mind though, is News of a Kidnapping… a chilling non-fictional tale, it cemented my respect for him as writer; I read it in the summer of 1996 I couldn’t put it down. I really enjoyed this. I think his short stories are next for me, as I build up to One Hundred Years… 🙂 You’ve made me curious about News of a Kidnapping. Correction: News of a Kidnapping was the summer of 1998 not ’96. I’m yet to read One Hundred Years… It is one of the ones on my ‘bucket list’ though ?.